After using a plywood template I cut out a piece of ABS backing board, crossed my fingers...and it fit! 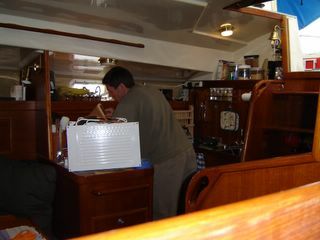 The new instruments will be mounted shortly. 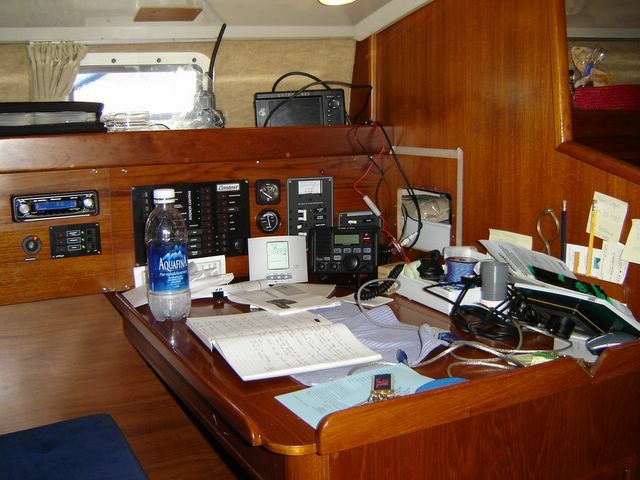 All we need now is a SSB/Ham radio and....South Seas here we come. No more ice....no more ice! As the updating continues one of the items on our "wish list" was refrigeration. We decided on a Nova Cool ice box conversion kit which will give me the option of re-using the plates if and when we decide to re-configure the whole galley counter. In the mean time.....ice cold beer! New topside look. I cut a piece of teak board to use as a backing then mounted the cockpit instruments. Raymarine ST60's will give us all the info we need to navigate us safely to untold pristine anchorages. 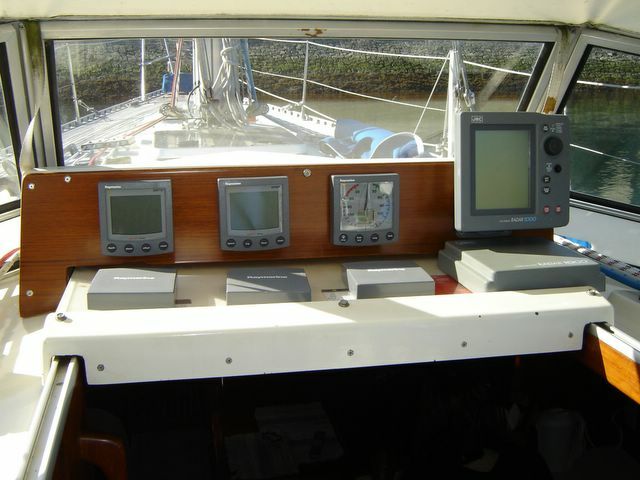 This will be the new nav station layout...more or less. 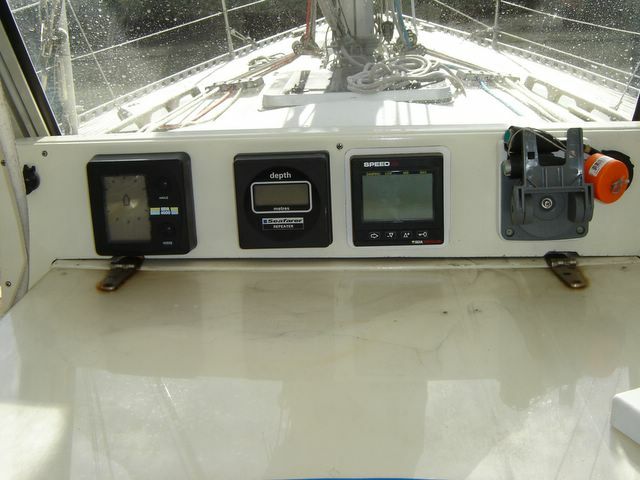 The Garmin chartplotter/GPS and nav tool bar came with the boat when purchased and will be re-mounted. I will be adding an ICOM 502 DSC VHF radio, a digital barometer, Raymarine multi display which will give me all the cockpit nav info at the touch of a few buttons, a small 400 watt inverter to run the laptop when underway and a GFI outlet. 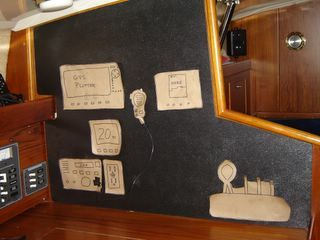 ...original nav staion. Time for a little update! Sorry for not posting any recent updates until now. We have not yet moved back to our live-a-board spot and as such have not had as ready access to internet use. Steve has been doing what he can despite having the full use of only one good hand. 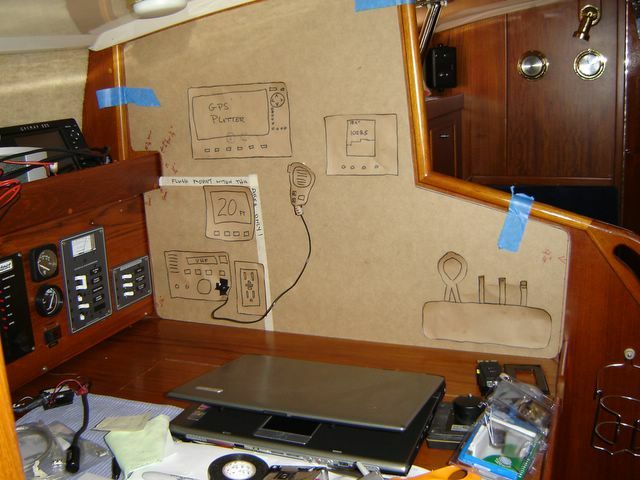 Projects continue but take much longer than anticipated. 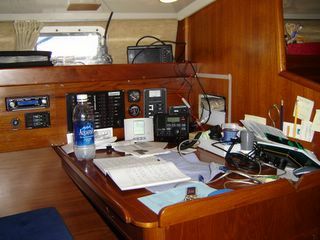 Some of the recent work done being: installation of a Nova Cool refrigeration system; 20" LCD TV mounted to the starboard side salon bulkhead ( you may, as we did initially, think this is a big TV to mount but after watching a few DVD's it is pretty awesome. Not to mention we now have our Nobeltec charting linked via laptop and 20' VGA cable from the laptop to the big screen so that we can see our GPS linked progress from the cockpit! 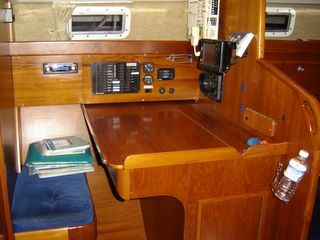 ); completion of the a/c system and outlets; new Raymarine ST 60 instruments mounted in the cockpit over the companionway; and as this first picture and the proceeding ones show, a totally re-worked navigation station with a new ICOM 502 DSC VHF radio, GFI outlet and digital barometer. 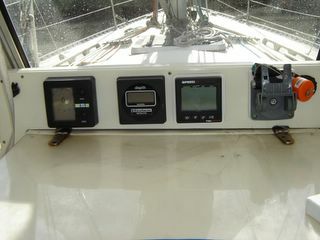 By next week the Raymarine repeater will be installed giving us all the cockpit read-outs down below at the touch of a few buttons.